ABP News is owned by the ABP Group. Three years short of hitting a century of its publication, Anandabazar Patrika is ABP group’s flagship. The Bengali language daily is published simultaneously from Kolkata, New Delhi, Mumbai and Silchar. According to the ABC, the daily has a circulation of 1.1 million copies. Star News, a bilingual, was its precursor which was launched in 1998 by Star India. When the government capped foreign investment in Indian media to 26 percent, Star India entered into a joint venture with ABP. However, in 2012, Star India exited from news business in India and after the split Hindi Star News came under ABP and was thus christened ABP News. Star’s Bengali and Marathi news channels also came under ABP’s ownership and were rechristened, respectively, ABP Ananda and ABP Majha. The group now has added a Punjabi news channel ABP Sanjha and a Gujarati channel ABP Asmita to its kitty. So, let us start with AFP, that is, advertiser-funded programming, the journalist tells him. This will help make an understanding. Pushp Sharma had another meeting with Anil Nair in Raipur, the capital city of Chhattisgarh. Here again, the journalist asks him to deploy investigative journalists to bring out stories on rivals, and he would not mind if he has to pay them extra for such an undertaking. “Ho jayega Sir lekin abhi dhyan rakhiyega dheere dheere start hongi cheejein … ekdum attack nahi hoga … dheere dheere (That will be done Sir. But keep it in mind that things will start gradually … we will not launch an attack abruptly … [it will be done] gradually),” we hear Nair commit again. We knew well that Anil Nair is not big enough, although no less important. Therefore, the journalist sought a meeting with someone higher in decision-making hierarchy of ABP News. The next meeting that Pushp Sharma had with Nair was in Delhi where he was accompanied by National Marketing Head Rakesh Kumar. Nair had already briefed his superior about the agenda. Telling him that his larger agenda is Hindutva, Sharma seeks support from ABP News to provide coverage to events such as a visit by the RSS supremo Mohan Bhagwat. Interestingly, Rakesh asks if they are lacking in giving such events coverage, not without reason. Listen to what Rakesh is saying: “Hum toh karte hee rahte hain nahi karte hain kum hai kya … aisa lag raha hai ki kami lag rahi hai aapko … ABP ko chahiye tabhi toh support bhi kar raha hai kyonki … you are so … actually toh agar kum hai toh batayein (We often do that[coverage]. Don’t we do? You think it is not significant … you think we are not doing enough [for you] … ABP needs … that is why we are supporting … you are so … actually. If we are lacking then tell us).” No, it is fine with us, the journalist says. You see there are things which will be laid down in black and white and for the rest we will have to arrive at a broader understanding. 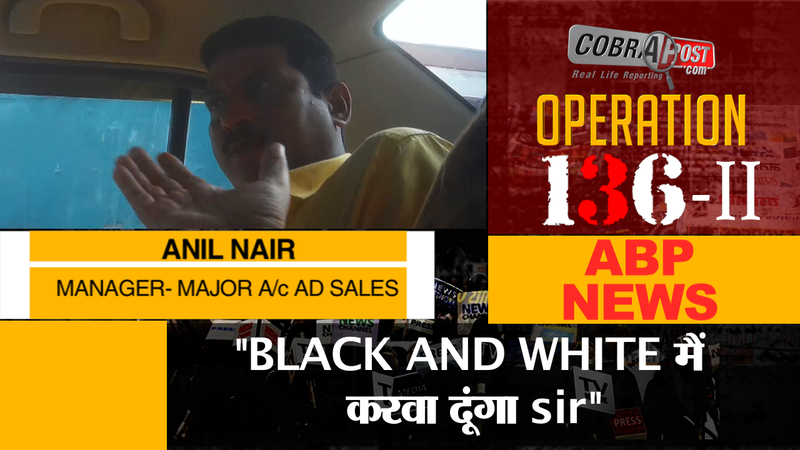 Rakesh asks the client the journalist to open up as he says: “Sir aap humein khul ke bole … main aapse khul ke baat kar raha hoon … without any hiccup inside… trust me… and jo bhi baatein hongi wo isi band kamre ki baatein ho rahi hain (Sir you can talk to us openly … I am talking to you openly …. without any hiccup inside… trust me… and what we are discussing will remain within the confines of this room).” Well, you will have to adjust cash payment, he tells Rakesh, as our Ashram gets cash in donations. Then, there is our agenda of Hindutva. The problem is that ABP News often hits out at our ideology. Rakesh seeks to know where the focus area of the media campaign would be. “Iske andar mein kahin na kahin humara focus area Chhattisgarh aur Orissa hai ya poore Hindustan ke jo bhi cheejein hoti hain (Tell me if our focus areas of this campaign are Chhattisgarh and Orissa or we have to cover the whole of India),” asks Rakesh. The journalist now tells him that he knows their channel has a wide reach. You colleague Nair has already discussed the financials with him and if it needs to be increased, we have no problem. He had also said that your investigative team would also do offensive stories against our rivals. If your team brings out investigative stories it would sure help us. So, let us begin with AFP for the first three months and as our relationship moves on we can do something more. But you have not done any investigative story on those who are ruling Hyderabad! This is what they do, Rakesh tells us. He says: “Agar dhyan se dekhiye toh unke jo sabse bade messiah jo sardar bane firate hain filhal jo MP bhi hain unke hum bahut kapade faadate hain … agar kabhi aapko observe karne ka mauka mila hoga toh hum log jab bhi bulaate hain unke bahut kapde faadate hain (If you have observed it closely we have literally torn their Messiah, who is also an MP … you had have the occasion to observe, we literally tear the guests apart).” Yes, what you say is true. But we need a dedicated team to keep a close eye on their activities, where they are investing. Those leaders have prospered by pilfering funds from government schemes. You can get a lot of information through RTI. I mean you can deploy a team, for instance, for West Bengal also. There is no doubt about it given their willingness to play ball!